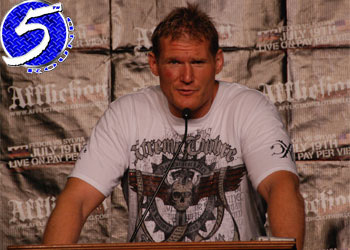 Barnett is expected to resume is MMA career when he meets Daniel Cormier in the finals of Strikeforce’s HWGP. The controversial 265-pounder easily submitted Sergei Kharitonov this past September to advance to the tournament’s championship round. For those of you wondering why Barnett is allowed to be a pro wrestler and Brock Lensar isn’t, it is believed Barnett is still working off his original Strikeforce contract which allows him to dabble in fake fighting. Or, his feud with UFC president Dana White is as strong as ever and White couldn’t care less about what Barnett does because he won’t be transitioning to the UFC anyways. HDNet will broadcast Dream’s event live in North America beginning at 1AM ET/10PM PT.